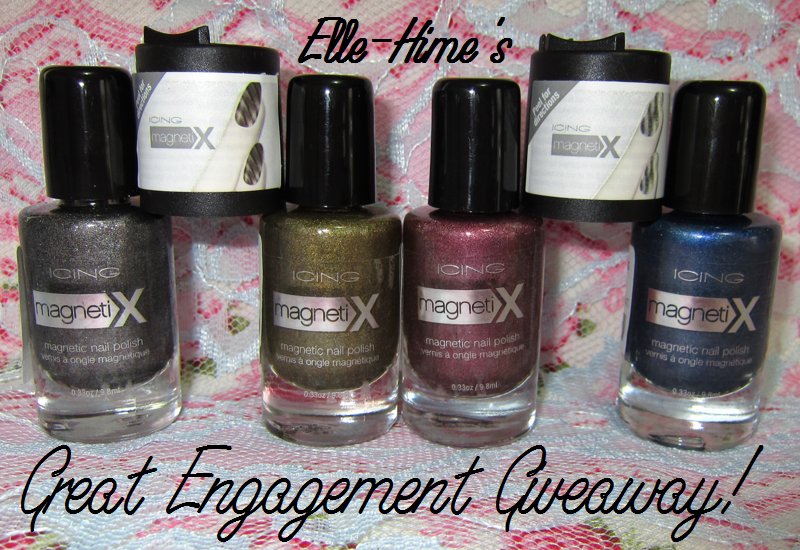 Princessly Polished: My Great Engagement Giveaway!! Yes, that is correct, I am engaged! I am such a happy girl. =) This happened on February 3rd and I've been keeping it a big secret in order to announce it with a celebratory giveaway. It has been a busy week! I suppose this also counts as my 200-follower giveaway, since I have a few lovely girls from HelloCotton joining my reader ranks. Read on below to learn how you can enter to win! As always this is a Rafflecopter giveaway. If you have any trouble entering or are confused by something, or notice a glitch/something wrong with the giveaway just leave a comment for me, I'll do my best to be helpful. I decided there wasn't any better prize for my engagement giveaway than magnetic nail polish. The reason? Both my fiancé and I think it is really neat; easily our favorite type of nail polish to play with. So, I am giving away all four of the Icing MagnetiX colors, along with their two design magnets - one creates diagonal lines, the other creates wavy lines. These are some of the best magnetic nail polishes and magnets that I have ever worked with; you can see swatches and read my full review here! Each of these nail polishes retails for $9.00, and I purchased them myself. I am only including 1 of each magnet cap because the other would-be-spare magnets are going to people as gifts. The polishes are brand new and unused. Use the Rafflecopter widget to record your entries - it also saves your E-mail address automatically, so I can contact you if you win. Leaving "enter me!" comments is totally unnecessary and you won't be entered by them! This giveaway will be running until March 10th, 2012. To clarify: Puerto Rico and the Northern Mariana Islands are not considered International - you are US territories so feel free to enter this giveaway if you are living in any of these places. You will get proof of mailing and will be sent by International Priority mail (generally takes 1-2 weeks). If you buy something from my Blog Sale, I will send your prize along with those items. Or, if you know someone living within the United States or US Territories I will happily mail to them! If this option creates too much trouble I may have to take it down. I don't want to be unfair, but this is the best solution I can come up with. Must be following my blog through either GFC or HelloCotton. Must be 18 years of age or older or have the consent of your legal guardian to enter. Must enter using the Rafflecopter widget and have valid entries. Illegal entries will result in disqualification. Congratulations Rochelle! Do you have a date set for the big day yet!? And thanks for the follow on Twitter! Aww, sorry about that... but thanks so much for the congratulations - I really appreciate it! Congrats on your engagement! Being married is fun. Congratulations on your engagement,may you enjoy wedded bliss for many,many years to come! Congrats on the engagement! I'm sure this is a wonderfully happy time! I'm loving the giveaway and hope I win :3 Best of luck and love! Congrats on your engagement! that is so amazing! You are very lucky!!! This giveaway is great! thanks for the chance! The magnetix are really fun - it's worth picking up a color you like just to get to play with them!